Product information "Blue chromate conversion coating"
The chromate conversion coating is a quick corrosion protection for zinc and aluminium surfaces. Apply the protection layers (chromate layers) with the Tifoo Blue Chromate Conversion Coating (also called thick film passivation) and give zinc a noble finish. The term chromate conversion coating / thick film passivation of zinc describes the blue undertone that the tin surface will have after the treatment. 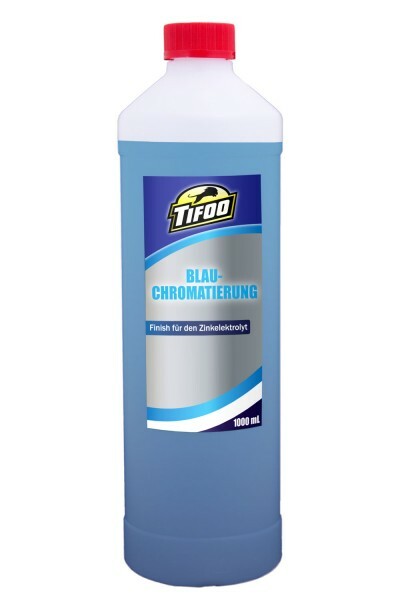 The chromate conversion coating is realized by dipping the object in a bath of Tifoo Blue Chromate Conversion Bluing. Without the need of any voltage or of working with other tools, you will obtain a thin layer of chemical conversion. The zinc surface is lightly removed with the thick film passivation. The zinc layer should consequently not be too thin, for that can cause erosion of the zinc. Please keep in mind that this is a Cr (III) based variation of blue chromate conversion coating (thick film passivation). The current version based on Cr (VI) isnt allowed anymore in Germany for chromate conversion coating by the directive of the RoHS because of the toxicity of Cr (VI). Tifoo Blue Chromate Conversion Coating – the perfect corrosion protection for zinc surfaces. Easy self-made chromate conversion coating! 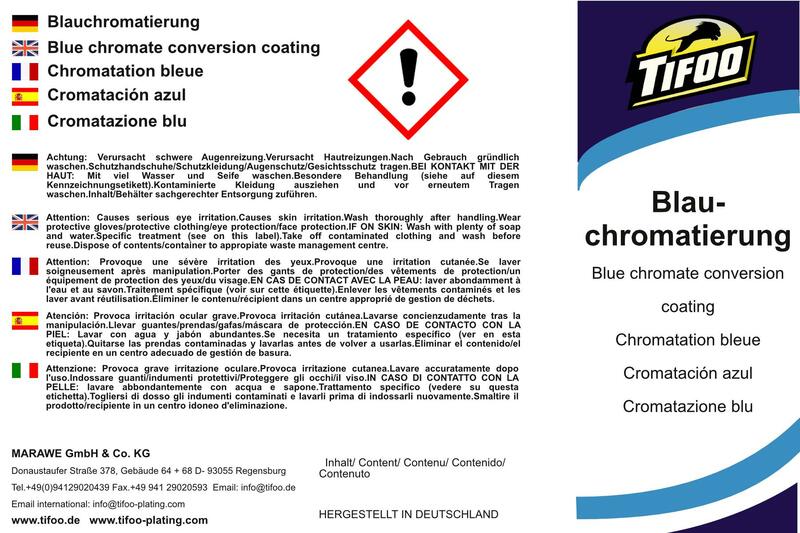 Related links to "Blue chromate conversion coating"
Instruction manual for Tifoo Blue chromate conversion coating as PDF file. Customer evaluation for "Blue chromate conversion coating"